Lack of sleep during adolescence and early adulthood accelerates Alzheimer's disease (AD)-related tau pathology, finds a study of male and female mice published in JNeurosci. These results support the importance of establishing healthy sleep habits in early adult life to help stave off progression of neurodegenerative diseases. 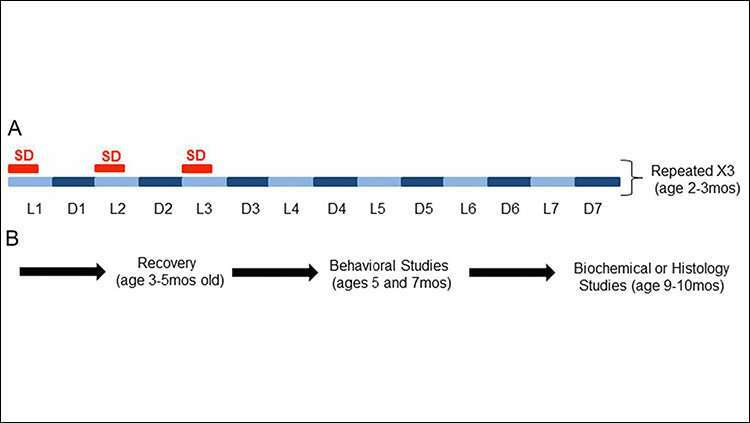 Using a mouse model of tauopathy, Sigrid Veasey and colleagues investigated two forms of sleep disruption increasingly common in modern society: chronic short sleep (CSS) and chronic fragmentation of sleep (CFS). Both forms of disrupted sleep led to an earlier onset of the motor impairments that develop in this mouse model and increased tau pathology in the locus coeruleus—the site of some of the earliest degeneration in AD—and portions of the amygdala. CSS also exacerbated loss of neurons in both regions. Together with previous findings that sleep loss contributes to accumulation of amyloid plaques—the other main culprit in AD—these results demonstrate the influence of sleep on neurodegeneration in aging.